The river was running at a level of 7.6m but has dropped back 0.7m from its peak. Elsewhere, the Haast River neared a high-level mark but levelled off at 7.6m. However, the Hokitika River continues to rise, sitting at 5m around 7pm. "I called a state of emergency, the reason for that is that we've lost the Waiho Bridge at Franz Josef, it's been demolished," Smith said. The main highway connecting Otago with the West Coast is closed from Makarora to south of Hokitika. The NZTA extended the closure of State Highway 6 just after 1pm, after it was closed between Franz Josef and Fox Glaciers earlier this morning when two slips covered the road. “State Highway 6 is currently closed south of Hokitika," said NZTA Network Manager Colin Hey this afternoon. Flooding has also closed the Wanaka-Mt Aspiring road, and Kinloch Rd in the Queenstown Lakes District. The rain has also closed a second key highway to the West Coast this afternoon. SH73, the Arthur’s Pass/Otira route is closed at at Candys Creek owing to a slip. It will be reassessed on Wednesday morning with an update around 8am. Ritchies have suspended all bus services tomorrow for the West Coast. The NZ Transport Agency asks motorists to take extra care with the extreme weather, debris and flooding impacting sections of road. Contractors are assisting with road management as a number of roads and highways are closed in sections due to slips and surface flooding. Localised flooding on the South Turnbull Rd in Okuru and south of the Arawhata Bridge has resulted in self-evacuations south of the bridge. MetService reports a strong and moist northwest flow covering the South Island ahead of an active front over the Tasman Sea is to blame for the weather. Significant rainfall has already fallen in southern Westland, Fiordland and the headwaters of the south Canterbury and Otago lakes and rivers. In addition, heavy rain warnings are also in place for Buller, northern Westland and the north Canterbury headwaters. MetService said the strong front will slide over the South Island today before breaking on to the North Island tomorrow, bringing with it strong winds and heavy rain. 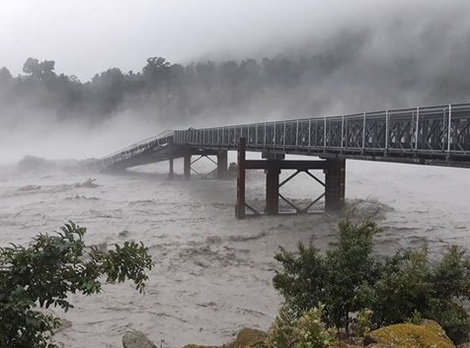 Haast resident Kerry Eggeling earlier said rain in the area in the past 24 hours had led to a couple of buildings at the Waiatoto River to be flooded, but he believed the worst of the storm was over. Most of the rain had fallen in the hills towards the Haast Pass, he said, and the rain on the front country was nothing to be concerned about. "The tide is on its way in now, but I believe the biggest part of the rain has gone. As the tide rises now, the rivers will drop, so there won’t be much change in the water levels. "As soon as it stops raining in the hills, it doesn’t take long for the rivers to drop because its such a short distance from the mountains to the sea, so it doesn’t take long for the water to run out."